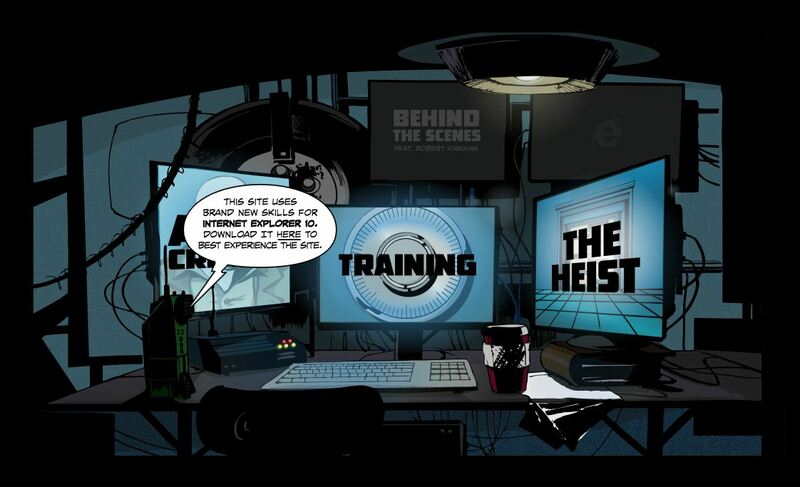 Robert Kirkman’s Thief of Thieves comes alive on Internet Explorer 10 as an interactive comic book. The site includes multitouch, HTML5 supprt as fans can create their own thief identity. You can see it all for yourself and try it out here. Today we’re excited to announce the online debut of Thief of Thieves: Experience, an interactive online game based on the comic book series from Robert Kirkman and Skybound, his imprint at Image Comics. The site is a showcase of the new features in Internet Explorer 10, including full multi-touch capabilities and HTML5 support. We thought bringing the comic book style to the web would suit the immersive, chromeless browsing experience on Internet Explorer with Windows 8. The Thief of Thieves comic tells the story of Conrad Paulson, alias Redmond – a happy coincidence as that just happens to be the hometown of Microsoft’s headquarters. Redmond is a master thief who steals from other thieves to make up for his past robberies and gain redemption. Each arc of the comic is written by a different writer echoing Robert’s experience in the writers’ room on The Walking Dead television series. Thief of Thieves was an instant hit when it was introduced in February, 2012, so much so that AMC immediately began developing Thief of Thievesas a potential series with Robert serving as creator/executive producer and writer. Needless to say, we were beyond excited to work with Robert to bring the style of the books online. With the Thief of Thieves: Experience, fans can create their own secret thief identity, practice their skills in larceny, and ultimately participate in one last job — the big heist. “I’m really pleased with how well the web experience captures the setting we were trying to build for Thief of Thieves. It’s a great way for fans of the of the Thief of Thieves comic books to immerse themselves in Redmond’s world and really interact with the story,” said Robert Kirkman. Written by: Hyde13 on February 19, 2013.